They're dropping the ball in NYC. But it's a good thing. 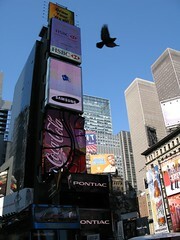 The ball that drops on Times Square at midnight on New Years will be powered by people. There is a 'power lodge' in place and it's attached to bicycles. People can pedal for a time and help charge the batteries that will power the ball droppingness. 230 hours of pedalling are required to generate the power needed for the 10-15 minute duration. On December 17th, there was 95 hours collected, about 35% of the total. Here's hoping more people will get out and pedal. We posted previously about the christmas tree in Hyde Park using human-powered goodness to light up. Thanks to Lynn for the link. Read the article on Reuters. 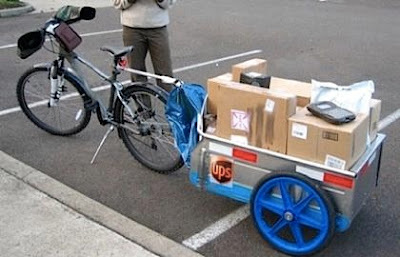 UPS has started enlisting the help of bicycles and trailers to deliver packages. "The company estimates that for every three bikes deployed during peak season on the West coast, it will save around 17 gallons of fuel per day and about $38,000 dollars in vehicle maintenance costs." You can read about this initative here. Thanks to Toby for the link.